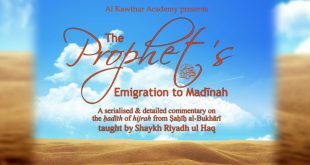 The Prophet’s ﷺ Emigration to Madinah. A serialised and detailed commentary on the hadith of Hijrah from Sahih al-Bukahri. A 7 Part Series Delivered by Shaykh Riyadh ul Haq at Al Kawthar Academy (Leicester).